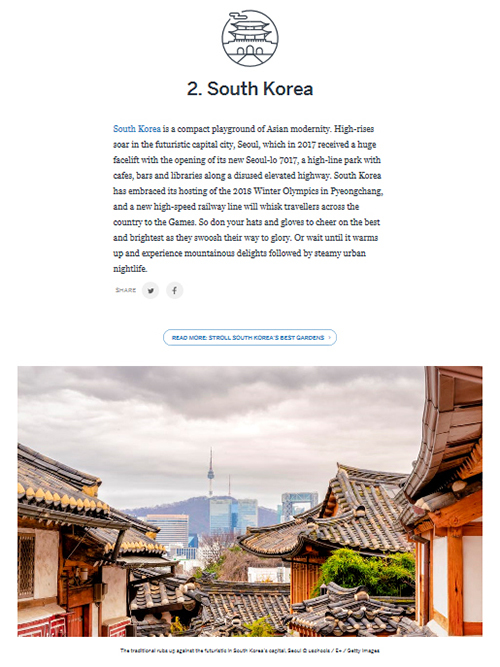 Lonely Planet, a publisher of travel guides and related media, has recommended Korea as one of its top-10 countries to visit next year. One of the highlights, of course, is that Korea is hosting the PyeongChang 2018 Olympic and Paralympic Winter Games in February. “Korea has embraced its hosting of the 2018 Winter Olympics in Pyeongchang and a new high-speed railway line will whisk travelers across the country to the Games,” said Lonely Planet.